This species is accepted, and its native range is Cameroon to NW. Tanzania and Angola. Small tree, shrub or climbing shrub, 1.2-1.8(-6) m. tall; bark papery, peeling, hairy. 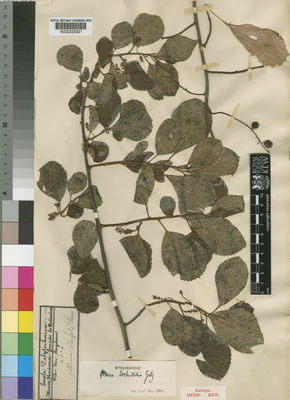 Leaf-blade ovate to obovate, 6-12.5 cm. long, 3.1-7 cm. wide, acute to shortly acuminate or occasionally mucronate, cuneate or rarely±rounded at base, shallowly±regularly toothed in upper 1/2-2/3, membranous (to chartaceous in the fruiting state), hairy above and beneath when young, mature leaves with indumentum usually confined to nerves and margins above and beneath; main nerves distinct, (5-)7-9 on either side of midrib, each vein running into a marginal tooth and ending in a mucro; petiole±1/4 the length of the leaf-blade, 1.5-2.9 cm. long, densely pubescent. Inflorescence a narrow little-branched, straggling many-flowered axillary panicle up to 1/2 the length of the subtending leaf, minutely pubescent. Flower hermaphrodite, with or without red gland-dots or streaks, 5-6-merous; pedicels 1-3.5 mm. long, pubescent with 2 paired narrowly lanceolate pubescent bracteoles. Calyx campanulate; tube almost obsolete; lobes ovate,±1 mm. long, with minutely ciliate margins. Corolla white or creamy yellow, 2-3 mm. long; lobes ovate, united at base, glabrous. Stamens adnate to corolla a short way below anther; anthers ovate, emarginate, less than 1 mm. long. Ovary inferior; placenta ovoid, usually markedly apiculate; ovules few to many, embedded in 1 row around basal part of placenta; style usually slightly curved; stigma cushion-shaped, occasionally lobed. Fruit a globose berry, yellow-brown, crowned by persistent calyx and style, 7 mm. in diameter, sparsely hairy. Seeds resembling those of M. lanceolata in surface texture. Forest and edges of colonising woodland; 1050-1200 m.
Brundu, G. & Camarda, I. (2013). The Flora of Chad: a checklist and brief analysis PhytoKeys 23: 1-18. Halliday, P. (1984). 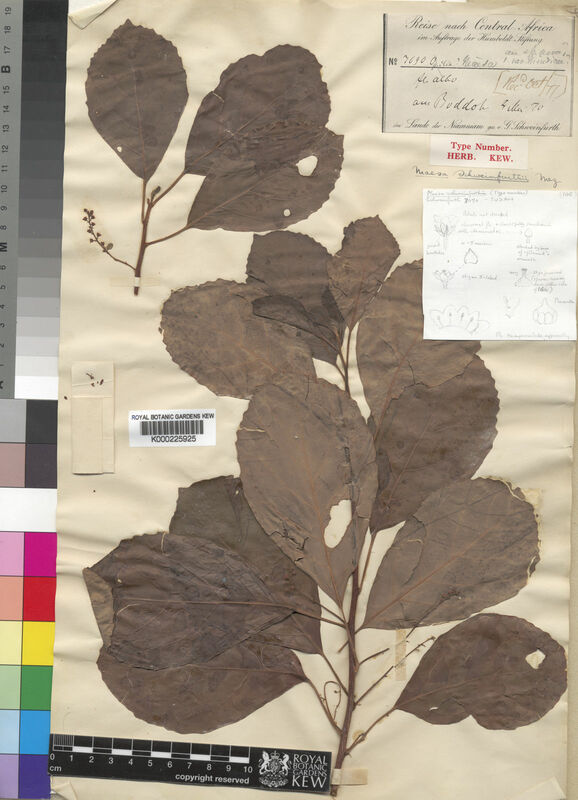 Flora of Tropical East Africa, Myrsinaceae: 1-21. Troupin, G. (ed.) (1985). Flora du Rwanda 3: 1-729. Musee Royal de l'Afrique Centrale. Mez in A. Engler, Das Pflanzenreich IV. 236: 24 (1902). Hiern, Cat. Afr. Pl. Welw. 1(3): 637 (1898). Gilg in Notizblatt des Botanischen Gartens und Museums zu Berlin-Dahelm 1: 72 (1895).